Camp Arizona: I’m talking with Gary Peaslee today. He’s the park manager at Cattail Cove State Park in Arizona. How are you doing today, Gary? Gary: I’m doing very well, thank you, Clint. CA: Let’s talk a little bit about the history of Cattail Cove State Park. How long has it been there and how did it get its start? Gary: The location has been around – I’ve talked to people who have been here in the ’50s. There was a little fishing spot on Lake Havasu down on Dirt Road, down to where the cattails came in on the little cove, and it was very popular for rough camping and fishing, a little fishing camp basically. It became a state park in the 1970s, when the state parks basically had most of the shoreline on the Arizona side of the lake. Since then, many changes have taken place with land swaps, and many different agencies control the lake now. The politicians all got together and did all types of swaps and things. We ended up giving away a lot of our land along for other acquisitions within the state, Sedona area being one of them. We have a state park there. 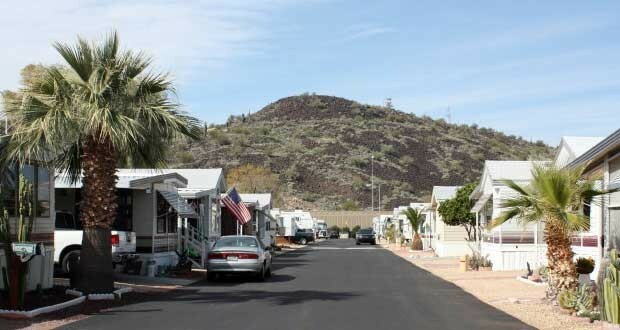 The way it looks now is we have 2,000 acres that is Cattail Cove State Park; we sit more on the southern end of the lake, and we have our larger park, which is Lake Havasu State Park, is down in town itself, kind of in the main part of the city. So we have two different parks, but one is more centralized, and then we’re kind of in the outskirts. CA: What are the most popular activities in Cattail Cove State Park? Gary: Fishing is big. Of course, being on the lake. It’s a beautiful clear, warm lake that is continually filtered through the dam system that comes down through Hoover and Davis Dams and goes down through Parker Dam here, down just south of us. CA: What kind of fish? Gary: Mostly stripers, striped bass, largemouth bass. We have catfish. That’s kind of our main gaming fish that people go for, are the bass and the catfish. We have definitely all the water sports, water skiing, the big, fast boats, as well as little – from kayaks to the cigarette boats, we get everything in between. It’s a stretch of lake where the big boats can get out and play, and then a lot of little coves and so forth where jet skiing, kayaking, sailing. I noticed in town, the kite guys are out doing their thing. We do get some wind that comes through here occasionally. When fronts are pushed through southern California, we’ll get some wind here, and the kite guys go out. CA: I’ve always wanted to try that. Gary: Yeah, it looks like it could be fun. I think it’s a younger man’s sport. It looks like it would yank my arm right out of its socket. I kind of enjoy watching it at this stage in my life. When I was younger, I would’ve gone for it. I did windsurfing back in the ’80s when that got started and kicked off. There’s a little bit of windsurfing going on now, but that’s kind of lost its appeal, it seems, a little more lately. There is hiking. Mostly during the wintertime, starting now. We have a bunch of hiking trails here. We’re surrounded by public lands, so we do not have a lot of encroachment – or any, really, encroachment of communities per se. That’s what I like about the lake. It’s pristine in that we don’t have houses that come down to the lake’s edge and crowd the public out. It’s basically wide open, many hundreds of miles of shoreline from here going all the way up to the dam and beyond, which is up the river. You can stop and you can pull your boat in, you can go swimming, you can have a private cove without someone looking down on top of you. CA: Cool. In some of these pictures, it looks like that’s at least in part due to the topography. A lot of it looks unbuildable in some of the photos. Gary: Yeah, it is, but you can build on anything. But if it was private land, there would be more resorts and so forth. CA: They’d figure it out, wouldn’t they? Gary: Yeah, a lot of things are leased around the lake from public lands. There are some resorts; right next door to us, it’s Sand Point Resort. They have about 300 spots for everything from camping – we’re a campground; they have a lot more amenities. They have a little marina, they have a bait and tackle shop, gasoline available, a little store, little restaurant. They have more amenities than us. We’re more of a campground and cater to the camping. CA: What types of camping do you guys offer there? Gary: We have 61 sites presently, all with electricity. 30 amp service mostly, and a few 50 amp. We hope to get upgraded sometime in the future here, for everything for 50 amp, because of the larger units now. In the summer when it’s really hot here, two air conditioner units are desirable, but our 30 amp, you can only really run one air conditioner. That kind of holds back a little bit as far as what people’s comfort zone can be. But we do have a few 50 amps. I think it’s four campsites with 50 amps. The rest are 30, out of the 61. Each spot has its own water hookup, so water, electric, and we have a dump station. We don’t have sewer to every site. Nice modern restrooms, two beautiful restrooms. A boat ramp that accommodates up to four boats in time to be launched. We have a large parking area, 75 slot parking area for boat and truck and trailer rig for parking. CA: Is there a charge for the boat launch? Gary: Yes, for launching, it’s presently – and everything’s subject to change, for which we would have to stay in communication if it was changed, but right now it’s Friday, Saturday and Sunday, it’s $15 entry fee for any rig that comes in, whether you’re launching or not, and then $10 during the week, Monday through Thursday. And that’s good till 10:00 at night. We do have 30 sites that are accessible by boat only. There’s no roads back to these sites. And they’re out on the lake. One really popular – we have about a mile and a half of shoreline that’s developed into campsites and day use areas, some of them with beautiful white sandy beaches called the Three Dunes Area, one of the more popular places to go on the lake – and accessible, like I said, by boat only. You could kayak out to them, you could take a little boat or whatever. But you can’t drive out to these sites. CA: It’s a rare thing to find a truly secluded campsite these days. Gary: It is. Like I said, they’re not being stared down upon by other houses. I lived in Washington state, I was a ranger up there for 20 years, and the lakes up there were rimmed with private housing. There were always a couple of public accessible areas, but you had to find them, and most of it was you couldn’t go to shore. There was people’s docks or people’s houses. So it is really nice to have it where you can just pull over at any point you want to and have access to the beach, to a cove, to your own private area. It really is nice. CA: Absolutely. I just have two more questions for you. If you could spend just one hour in Cattail Cove State Park, how would you spend your time there? Gary: Of course, it depends on the season. If it’s wintertime, I’d probably go hiking and get all the different vistas and views of the lake from various points; if it’s too hot in the summertime, I would either go down and grab a spot on the beach and go swimming in our beautiful warm, clear waters, or if one had a kayak or something, you could go kayaking. If I had an hour, I would definitely be drawn to the water. That’s what we’re all about, either by hiking or swimming. Relaxing. CA: And if you could spend just one night in Cattail Cove State Park, which specific campsite would you choose and why? Gary: That’s a tough question, because it depends on one’s personal needs. A lot of people like to be down as close to the water as they can. Our most popular site is probably Site 5, which is basically on the beach. That way, people using the water, they’re right there. Their boat can be pulled up on shore, they can access the swimming beach. If you want more private and seclusion, Site 53 is kind of away from it all, up away from the lake, with lots of shade, very private. It just depends on what people want. Those two sites are probably the most popular; one right on the water, one probably as far away from the water – which is only a few minutes’ walk anyway, but up at the upper end of the campground is another site that’s more private. Each person has their own – one’s right in the middle of everything and one is more secluded. CA: Thanks for a little bit of insider info on the park there, Gary. Much appreciated. Gary: You’re very welcome. Come on out and see us. We’re open 12 months of the year and 7 days a week, 24/7, and we’re one of those parks that every season offers something new and exciting. When I worked in Washington state, we were closed during the winters. We’d have snow activities, but camping and so forth, it was limited to what you could do. We’re not limited. We’re sunny and nice all year round.